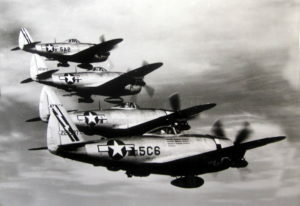 On the afternoon of May 28, 1944, a flight of four U.S. Army P-47s were flying in formation over Glastonbury when two of the aircraft collided with each other. One aircraft, a P-47D, (Ser. No. 42-8285). was piloted by 2nd Lt. Richard H. Ullman, Age 19, of Atlanta, Georgia; the other, a P-47D, (Ser. No. 42-22269), by another 2nd lieutenant. The flight had originated at Bradley Field in Windsor Locks, Ct.
Lt. Ullman was killed when his aircraft crashed and exploded in a wooded area. The other pilot managed to successfully bail out of his stricken airplane and landed safely. Meanwhile his airplane crashed and burned in a neighborhood known as Welles Village near the Glastonbury-East Hartford town line. A wing of the aircraft struck the roof of one home, but there were no reported injuries. Lt. Ullman is buried in Crest Lawn Cemetery in Atlanta, Georgia. To see a photograph of his grave go to www.findagrave.com, memorial #126643026.